How does a scout advance in rank in Troop 740? Troop recognition and badges are awarded at the next Troop meeting. a. Read the boyscout manual sections that pertain to that scout rank. b. Complete the advancement requirements by doing the activities described for each rank. c.	Review completed advancement requirements with the appropriate person (noted in section 3.c.i below) and have them initial and date each requirement in the scout’s handbook as it is completed. i. Completed requirements can be signed off by the Senior Patrol Leader, Assistant Senior Patrol Leader, a Troop Guide, an Eagle Scout that is active in the troop, the Scoutmaster or an Assistant Scoutmaster. Other scouts may sign off on requirements with the approval of the Scoutmaster. d.	Report completed requirements to the Patrol Leader at weekly troop meetings. e.	When all requirements have been completed and the scout is ready to advance, the scout notifies the Patrol Leader(PL) and then the scout and PL will meet with the Advancement Chair to verify that all troop records are up to date. a. Scout and Advancement Chair make sure all of the scouts requirements have been recorded in the Troopmaster program. b. Board of Review Form - After all the information is entered into Troopmaster, the scout will receive a printed Board of Review form from the Advancement Chairperson. This shows that the scout has completed all his requirements and will be used during the Board of Review. 3)	Schedule a Scoutmaster Conference. a. During a troop meeting, the scout and Patrol Leader notify the Scoutmaster that the scout needs a Scoutmaster Conference. i. Outside of a troop meeting – Every attempt should be made to schedule the Scoutmaster Conference during troop meetings. But on the rare occasion when this cannot be done, the scout may email the Scoutmaster directly to request a Scoutmaster conference. b. Once the Scoutmaster is notified, he will verify that the scout has the Board of Review form from the advancement chairman. c.	If the scout has those forms, the Scoutmaster will arrange a time with the scout to do the Scoutmaster Conference. d.	The Scoutmaster Conference is usually scheduled for the next Troop meeting, but may be done that day if time permits and the scout has all the proper paperwork. b. The purpose of the Scoutmaster Conference is not to re-test the scout on the skills they have learned, but help the scout realize what they have learned and make sure you are ready for the Board of Review meeting. c.	The Scoutmaster Conference is also a chance for the Scoutmaster to see how the scout is doing in the scout program and determine what the scout wants to do in the scouting program. The Scoutmaster will let the scout know what he is doing well, and let the scout know where there are opportunities for improvement and growth. d.	At the end of the meeting, the Scoutmaster will sign off the Scoutmaster Conference requirement in the scout’s handbook. i. If the Scoutmaster does not feel that the scout is ready for a BOR, he will not sign off on the Scoutmaster Conference requirement. The Scoutmaster will let the scout know specifically what needs to be done, and will arrange for another Scoutmaster Conference, usually the following week. The goal is not to punish the scout, but to make sure the scout is getting everything from the program that he should. e.	The Scoutmaster will also initial the Board of Review form. The scout is now ready to schedule the Board of Review meeting. a. During a troop meeting - The scout and his Patrol Leader notifies either the Committee Chair (currently Dave Ruester), or the Advancement Chair that he needs a Board of Review. i. Outside of a troop meeting – Every attempt should be made to schedule the BOR during troop meetings. But on the rare occasion when this cannot be done, the scout may email the Committee Chair or the Advancment Chair directly to request a Board of Review. b. Once the Committee Chair or the Advancement Chair is notified, he/she will verify that the scout has the Board of Review form with the Scoutmaster Conference completed. c.	If the scout has that form, that person will arrange a time with the scout to do the Board of Review with three to five Troop Committee members. d.	The Board of Review is usually scheduled for the next troop meeting, but may be done that day if time permits, the committee members are available and the scout has everything he needs for a Board of Review. i. To make sure that that work has been learned and completed. ii. To check the kind of experience the boy is having in his patrol as well as the Troop. iii. To assess whether the boy is ready to advance. iv. To encourage the Scout to advance to the next rank beyond the current one. d.	At the end of the meeting, the board members will ask the scout step away for a few minutes while they discuss the results of the board of review. When all members of the board are in agreement, they will call the scout back and inform him of their decision. i. If the scout has is recommended for advancement the board chairman will complete the Board of Review form AND sign off the Board of Review requirement in the scout’s handbook. ii. If the board does not feel that the scout is ready for advancement, they will let the scout know specifically what needs to be done to be ready for advancement. The board should schedule a future Board of Review meeting to discuss the progress towards advancement. The goal is not to punish the scout, but to make sure the scout is getting everything from the program that he should. e.	Immediately after the Board of Review, the scout informs the Scoutmaster of the results of the Board of Review. a. A scout is awarded the new rank immediately upon successfully completed the Board of Review. b. 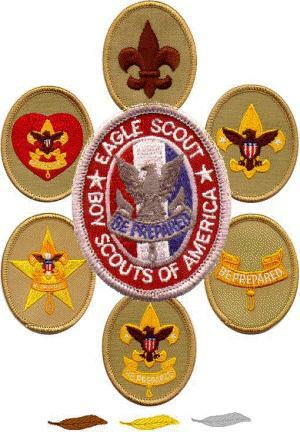 The Troop will announce and recognize the scouts advancement at that Troop meeting or at the next Troop meeting if that is not possible. c. Formal recognition with family and friends in attendance is done at the next Court of Honor, usually held twice each year.